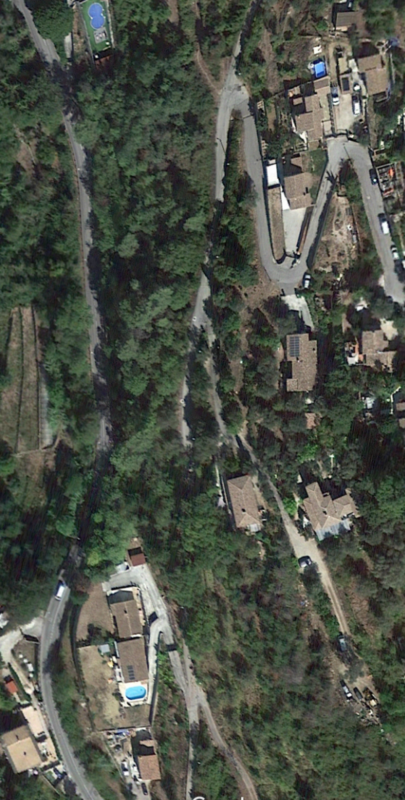 The line to Levens was an extension of the line from Place de Massena to Saint-André-de-la-Roche – Ligne 14 of the network in Nice. Trams for Levens were numbered 30. 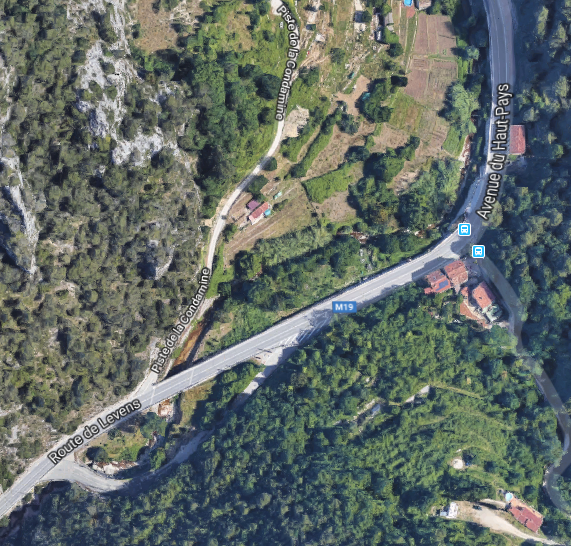 The lower part of the route is highlighted on the Google Satellite images here. 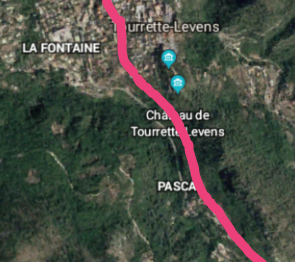 This covers the length from Tourrette-Levens to Nice (or vice-versa) and is in three parts, the first image shows the length immediately north of Les Moulins. 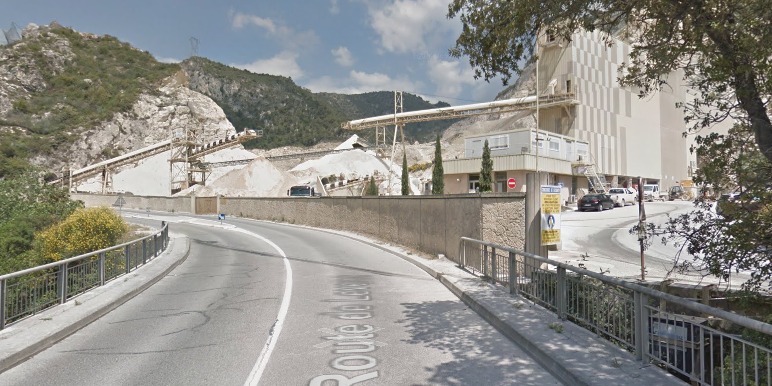 The second, the length south of Les Moulin’s through the present day quarries north of Saint-André-de-la-Roche. 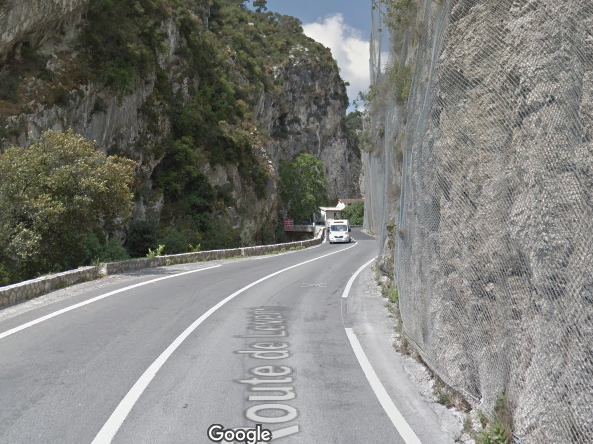 And the final length covers the route from Saint-André-de-la-Roche to Place Massena. 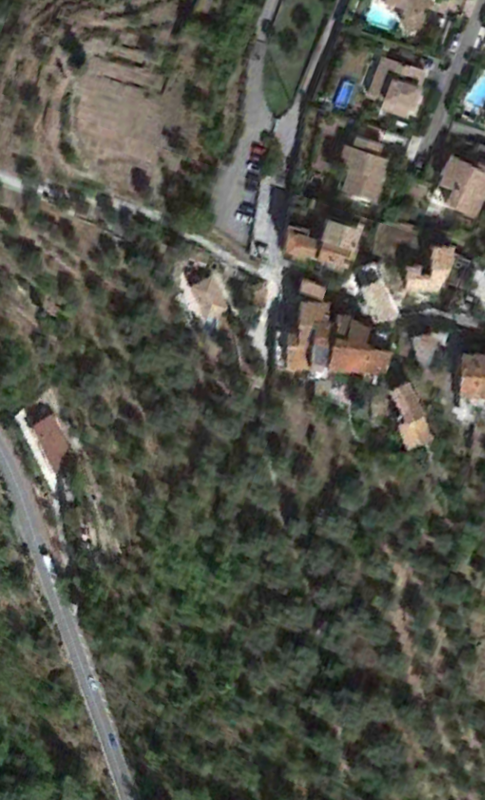 Place Massena is just visible north of the coast at the bottom of the last image above. 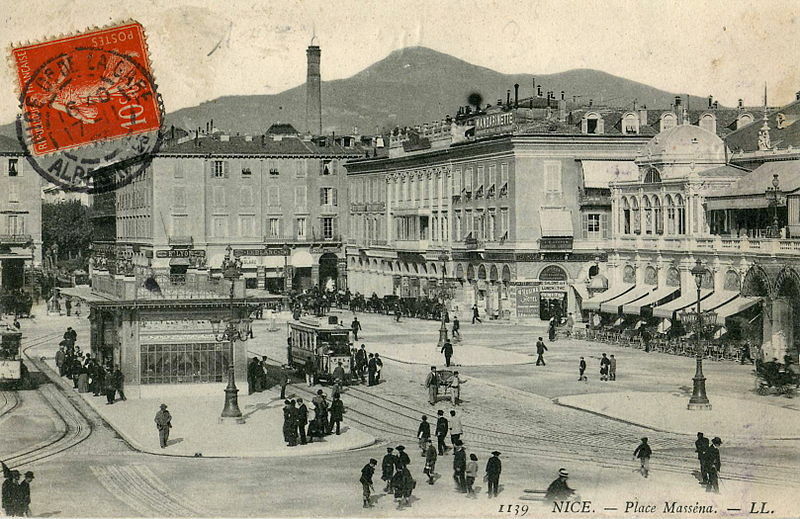 Our journey on the tramway starts at Place Massena in Nice. 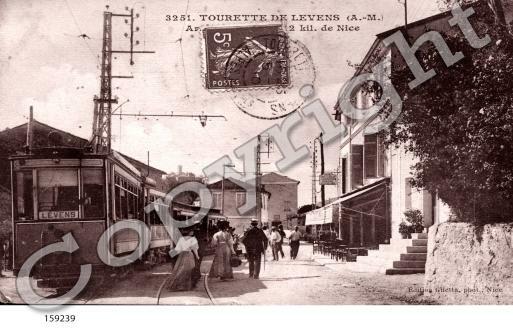 Trams￼ for Levens left Place Massena along the road at the centre-rear of the postcard image above. 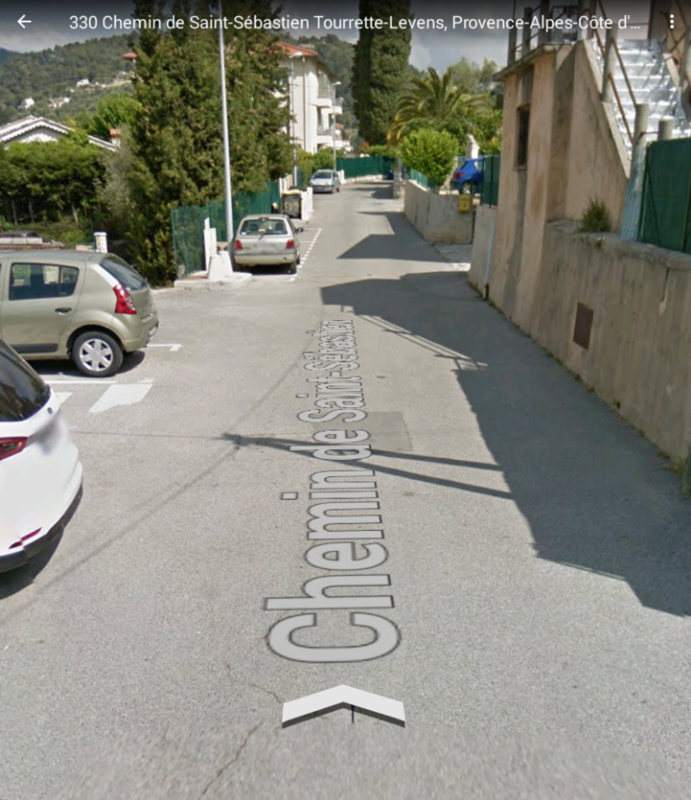 Rue Gioffredo heads to the right in front of the shop buildings at the rear of the square. Trams then turned right onto Boulevard Carabacel and left onto Avenue Gallieni, before heading out of Nice alongside the River Paillon on Avenue de Marechal Lyautey and Avenue Joseph Raybaud. 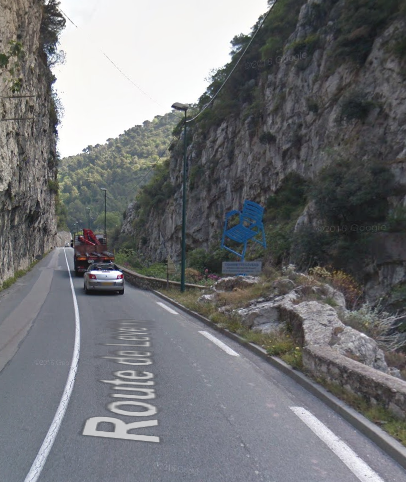 The tram route left the River Paillon on the line of the M19, Quai de La Banquiere which then becomes first the Route de Levens and then the Avenue du Haut-Pays. 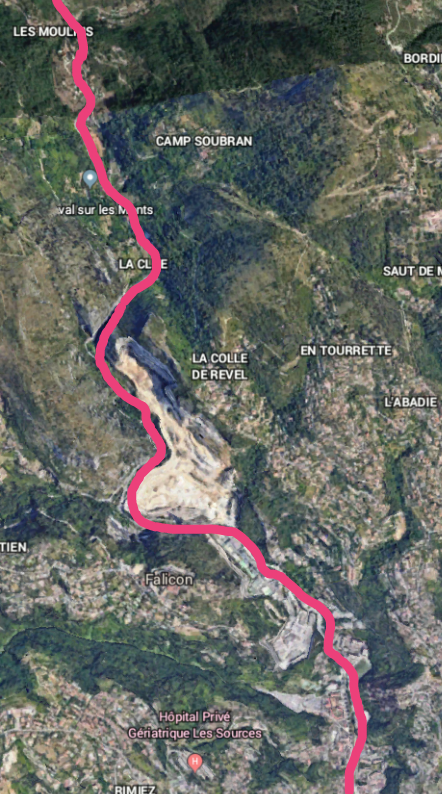 The following images give an impression of the route, although it must be born in mind that the quarrying enterprise north of Saint-André-de-la-Roche has expanded considerably in recent years. 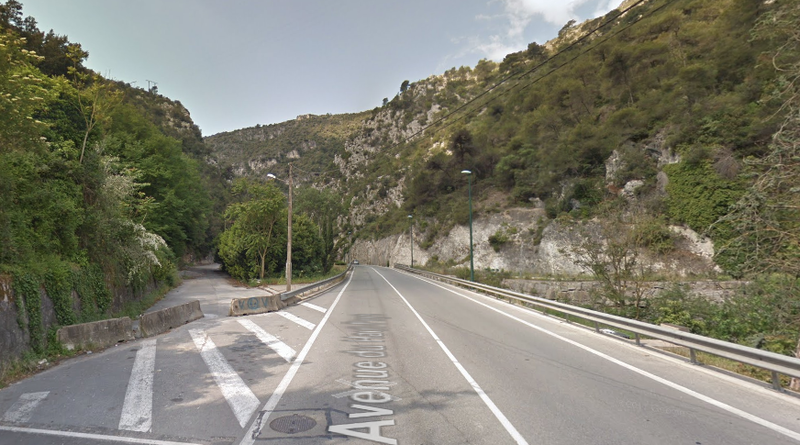 There were small deviations in the route of the tramway from the modern M19, although most of these were very short, only a matter of a few metres, and were usually the result of engineers seeking a path for the wider, newer road. This is true at La Clue, shown above. 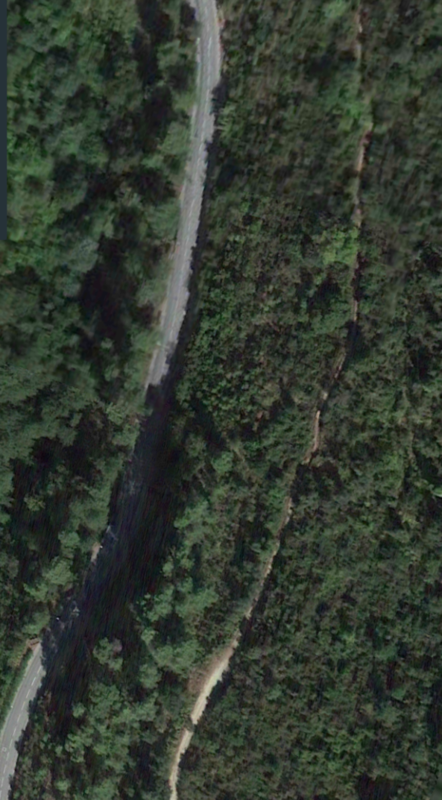 The first ‘significant’ deviation that I can identify, away from the line of the main modern M19 is shown on the adjacent map. 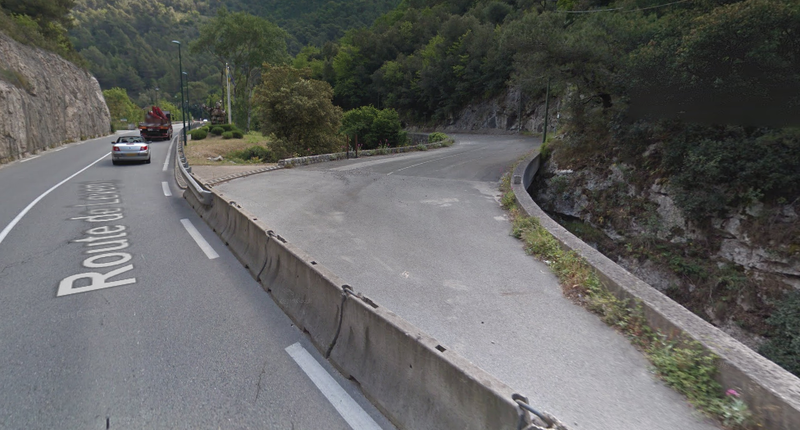 The Avenue de Haut-Pays splits either side of the River Banqiere over a short distance. 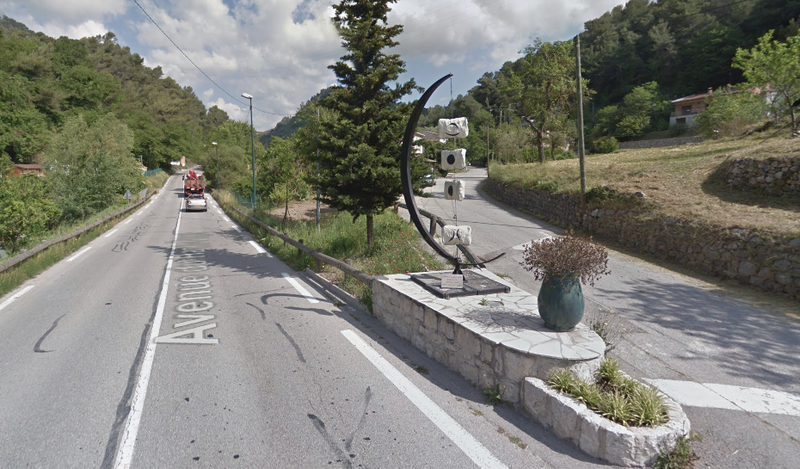 The newer, wider road is to the West, the older road which follows the route of the tram is to the East of the river. When the trams were in use the road surface would not have been of the highest quality and the roads were still relatively narrow. 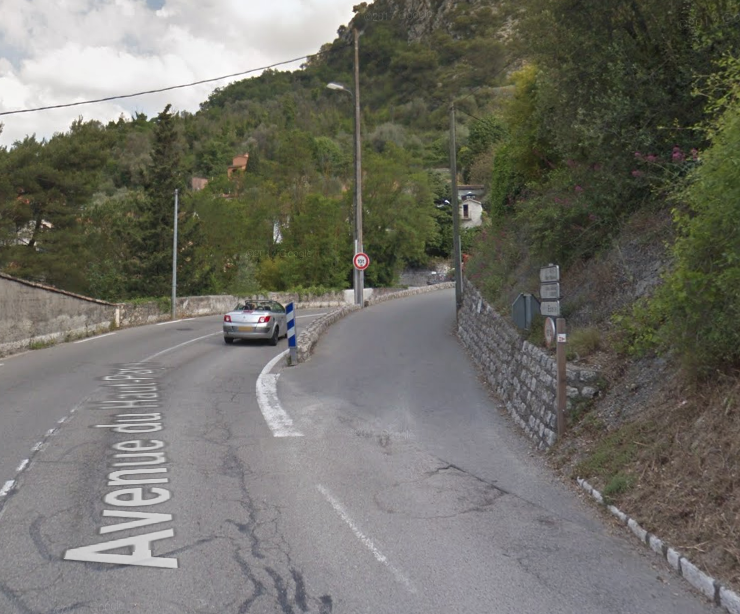 The picture below shows where the two roads named Avenue de Haut-Pays split. 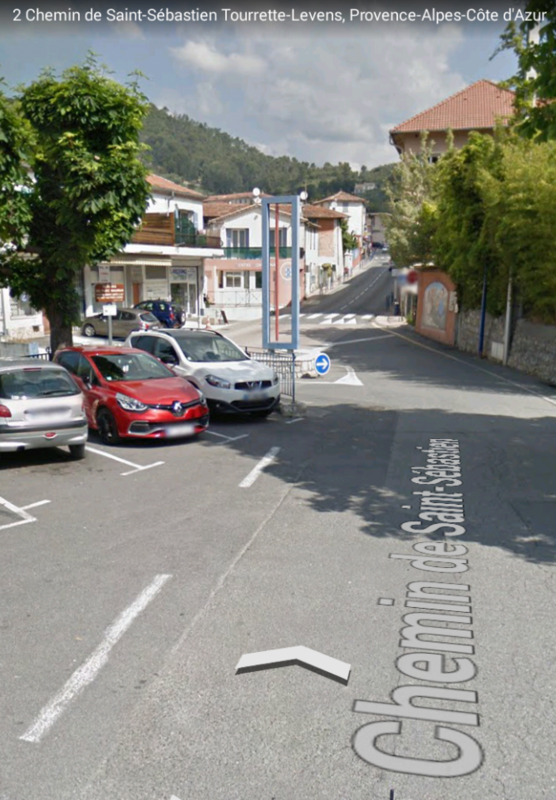 The bus stop shown on the map is on the right of the picture. 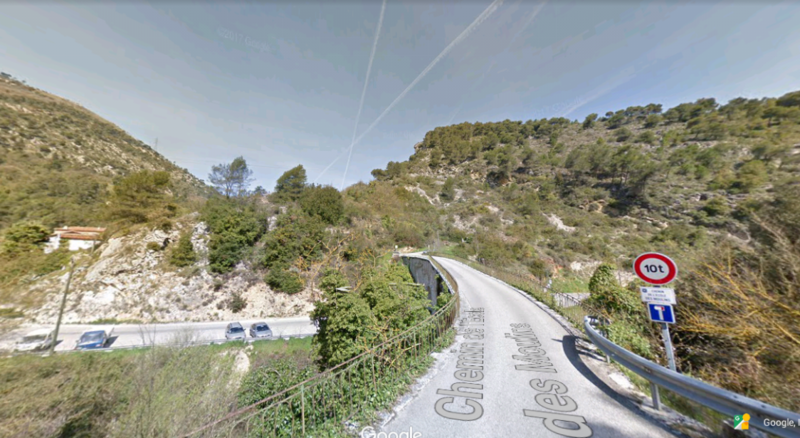 There was inadequate room to widen the old road at this location, so a new road was built along with two new bridges over the River (La Banquiere). 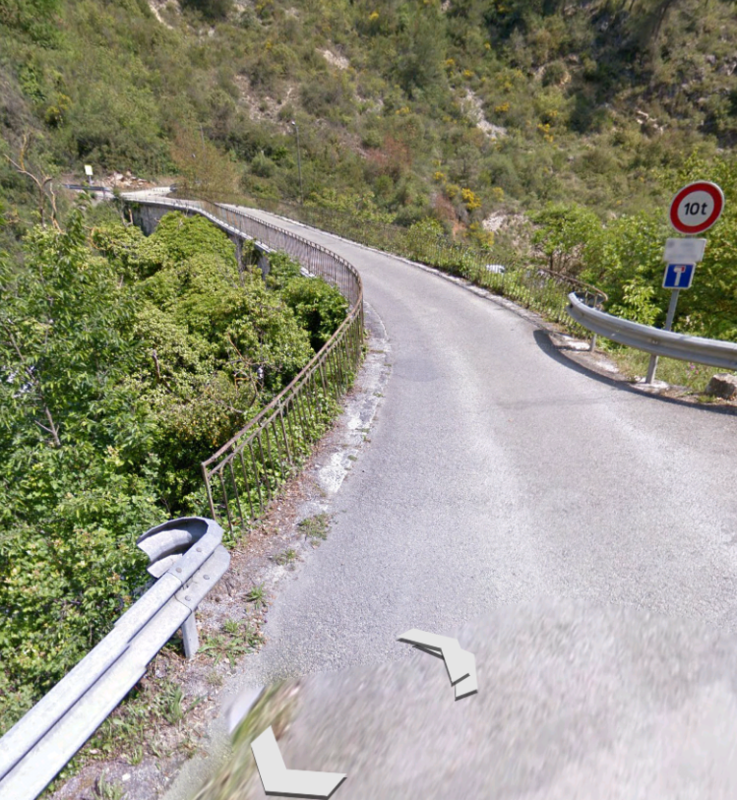 This next picture shows the point where the modern M19 rejoins the older and narrower road/tramway. 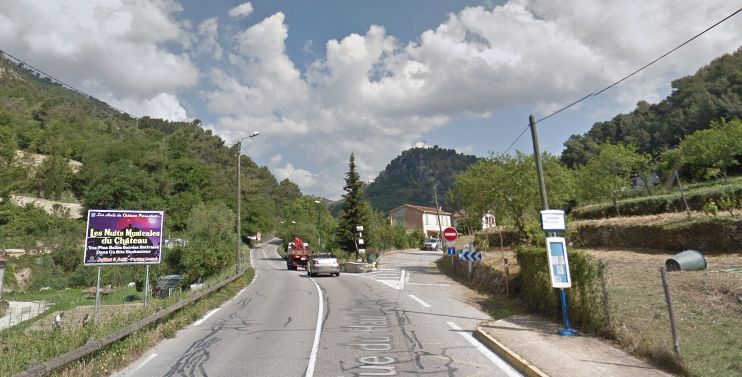 The tramway approached Les Moulins on a steady grade before branching off the lower road through the village and crossing a tributary of La Banquiere (Ruisseau de Rio-Sec) at a higher level. 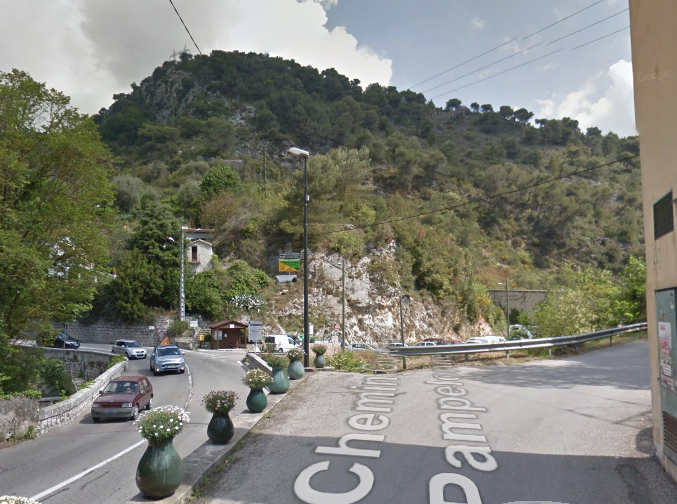 These next pictures show the tramway formation leaving the main M19 road along what is now called Chemin de l’Ecole des Moulins. 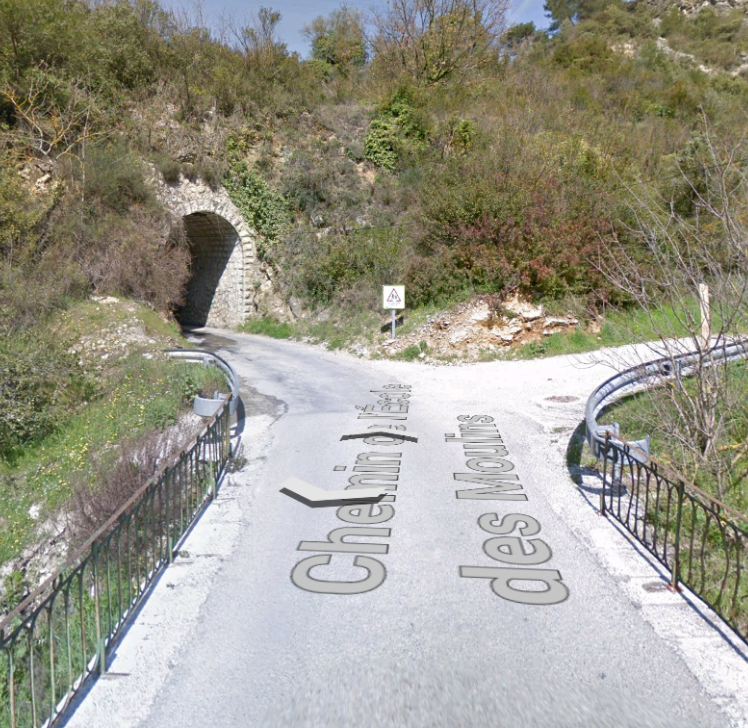 The bridge over the Ruisseau de Rio-Sec also crossed the road up the valley – Le Chemin de Tralatorre. 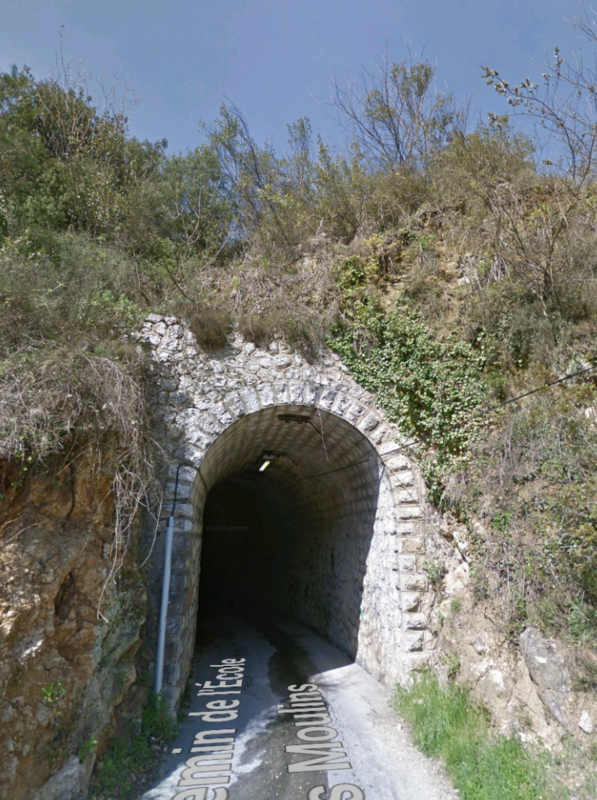 Immediately after crossing the valley the tramway entered a tunnel which took it back into the main valley of La Banquiere above the village of Les Moulins. 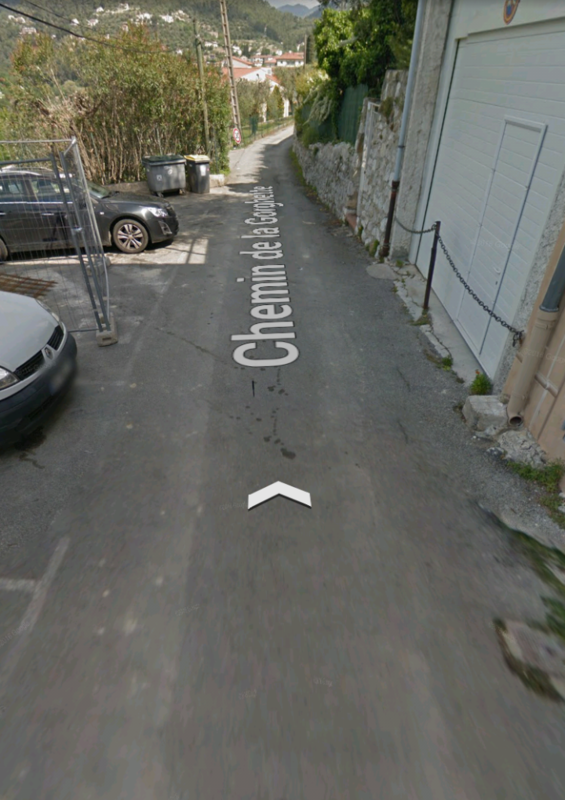 The route, including the viaduct and the tunnel, appears clearly as Chemin de l’Ecole des Moulins on the map below. 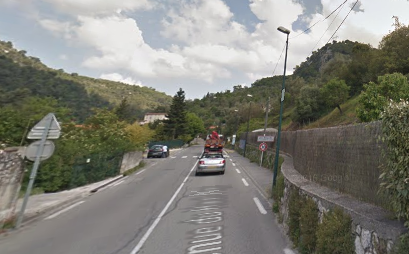 The tramway remained above the valley floor, first following the Chemin de l’Ecole des Moulins and they a footpath which is now named Sentier de la Gorghette until it reached what are now the outskirts of Tourrette-Levens. The map above and that alnogside these notes shows the route. 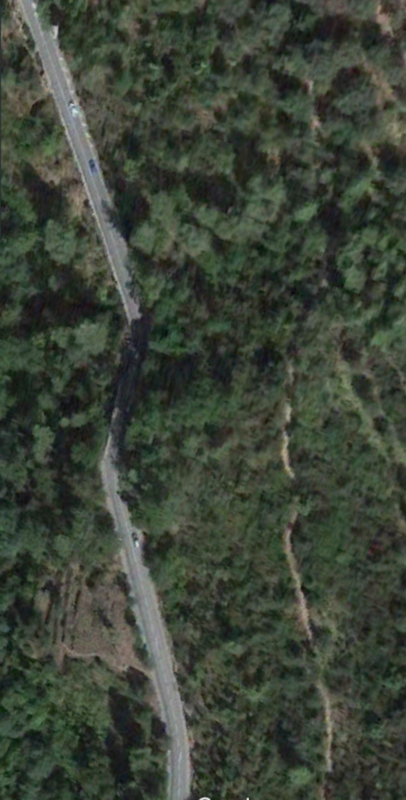 The images below show the same length of road directly above and to the East of the main M19. 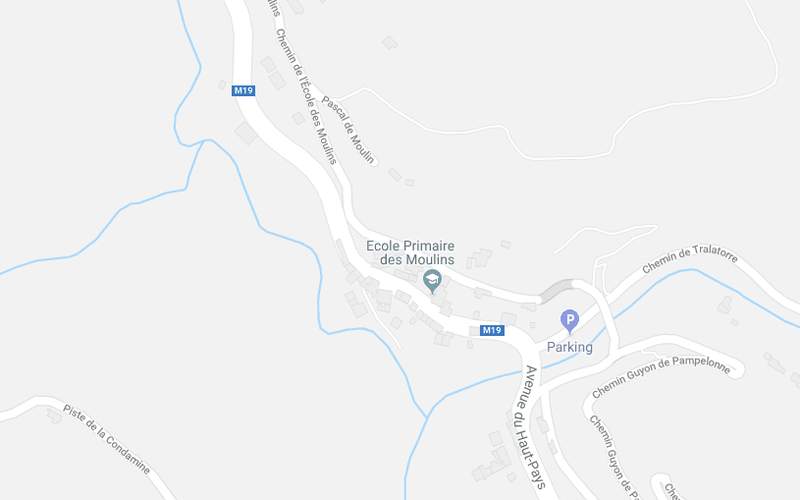 The satellite images travel in sequence from the south to the north, starting at Les Moulins and heading towards Tourrette-Levens. 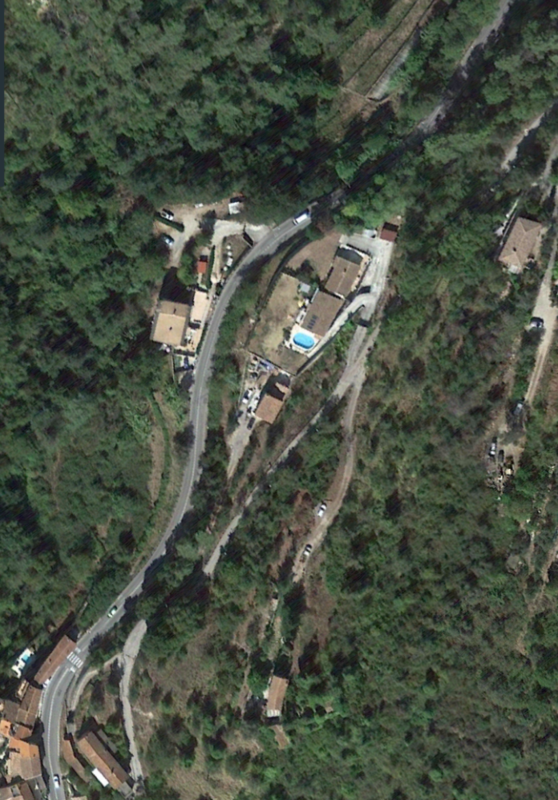 The swimming pools evident on these satellite images would not have been present when the tramway was in use and there would have been far fewer buildings hidden in the landscape. 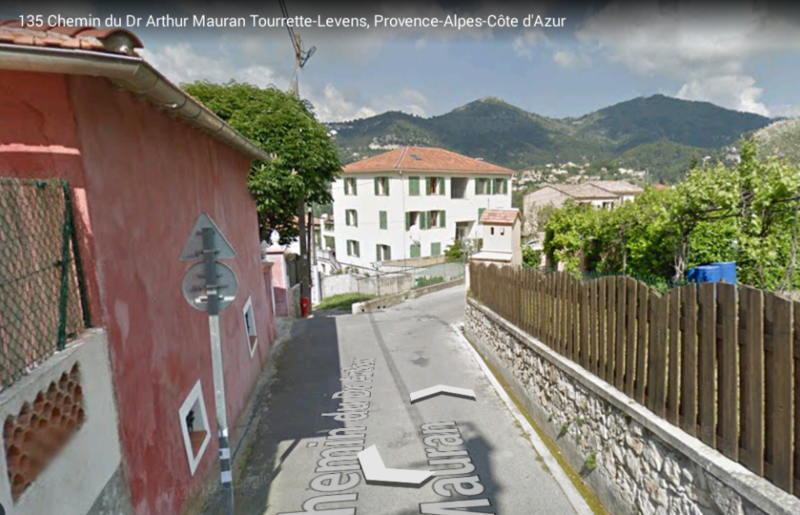 The last in the next sequence of images is not a satellite image, rather it shows the point at the edge of Tourrette-Levens today where the tramway entered the town. 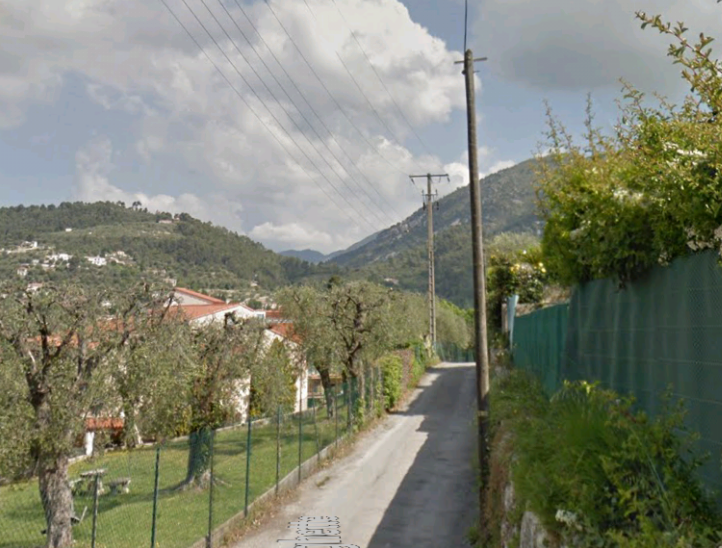 The camera is facing approximately southwards looking down the Sentier de la Gorghette. Turning to face north once again, this next view looks down the line of the tramway towards Tourrette-Levens. 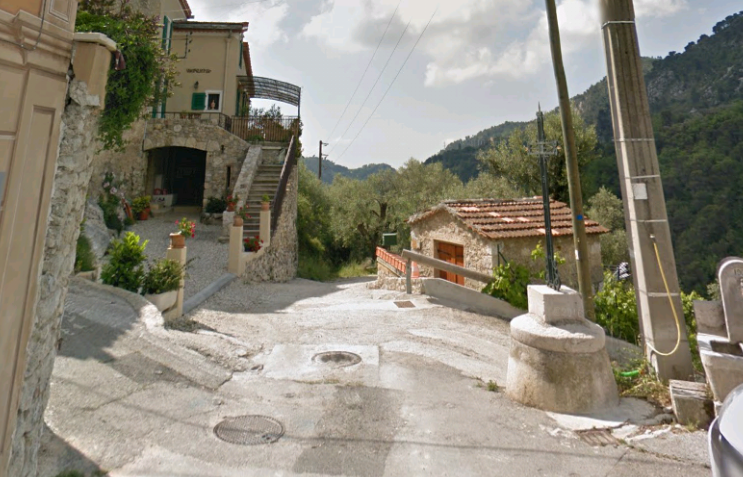 Subsequent images take the tramway down into the village. 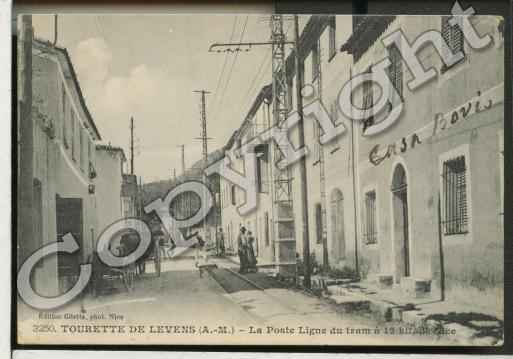 In Tourrette-Levens, we have a few pictures of the tram/tramway while it was in operation. 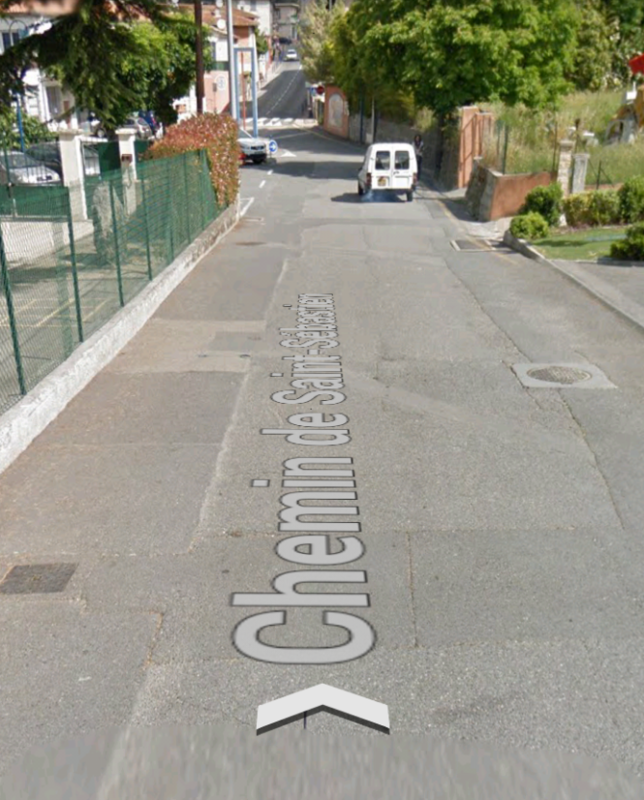 The first image is very small, but it shows a tram on the main street (now the M19) of the village, Boulevard Léon Sauvan. The image below shows a tram bound for Levens sitting at the stop in Tourette-Levens. 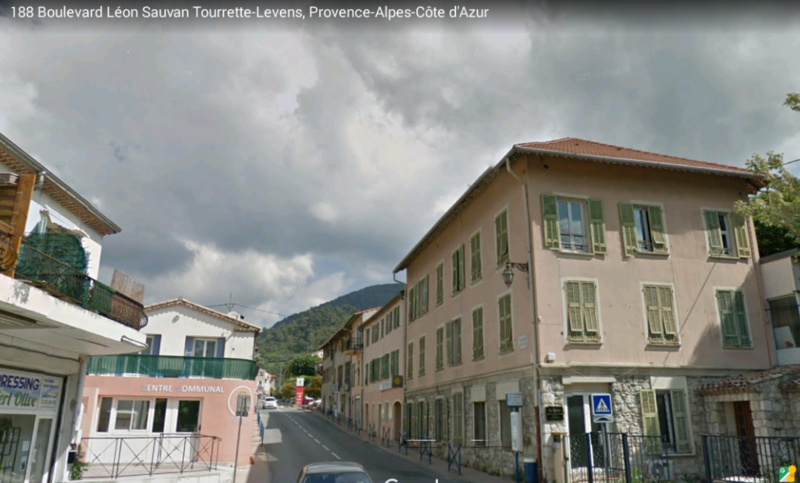 The fact that trams were able to pass at Tourrette-Levens is evident in the presence of two sets of rials which created the passing place. The image bears a copyright stamp from the Retro Photo Catalogue. The image which follows thatm also bears a copyright stamp but is from Cartes et Patrimone. The full details of the sites which hold the copyright are shown in the references below. Thw two images are from the same series of copyright free postcard images from the turn of the 20th Century. 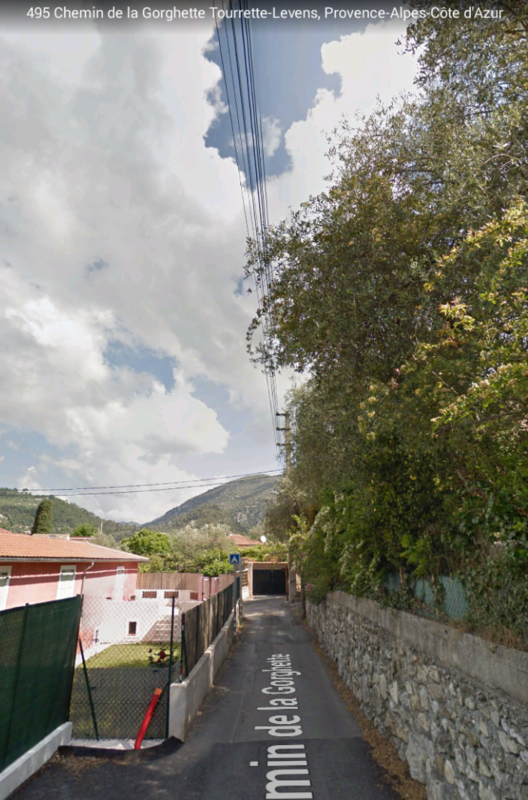 They are numbered sequentially, 3250 and 3251 and probably come from the camera of the same photographer. (I’d appreciate any details that readers can provide). I hope that link provides a taster for the next post (part 2 of this journey) which will hopefully provide more details about the route of the tramway between Tourrette-Levens and Levens. Retro Photo: La Banque d’Images Anciennes; http://www.retrophoto.fr/catalogue/pellicule/localite/35874/label/TOURRETTE%20LEVENS, accessed 20th March 2018. 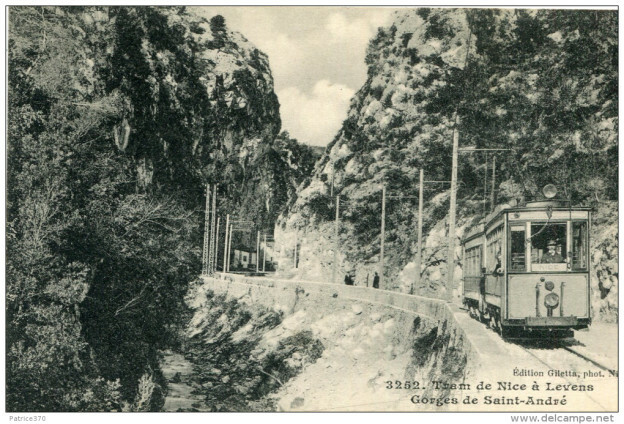 Cartes et Patrimone; https://www.cartes-et-patrimoine.com/alpes-maritimes-tourrettelevens/carte-postale-ancienne-ville-tourrettelevens-ph008971-p-170864.html, accessed 20th March 2018. 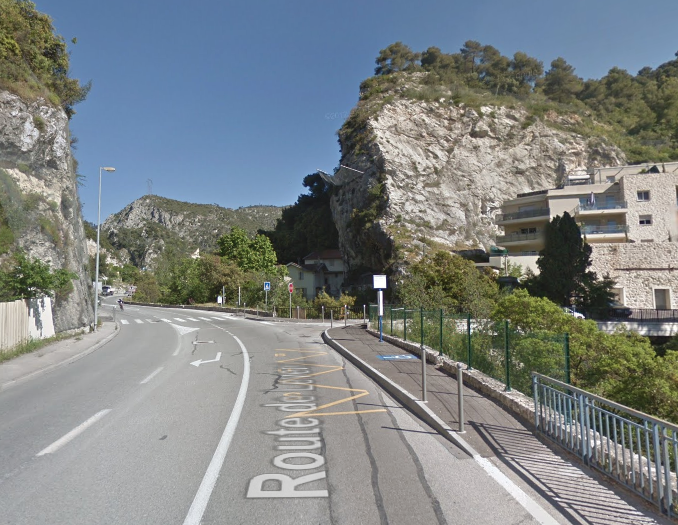 This entry was posted in Railways and Tramways Around Nice, Railways Blog on March 20, 2018 by rogerfarnworth.